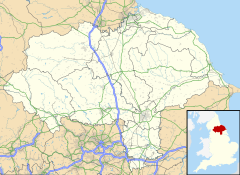 Kirkleatham is a village in the unitary authority of Redcar and Cleveland and the ceremonial county of North Yorkshire, England. It is located approximately 4.5 mi (7.2 km) north/north-west of Guisborough, and 3 mi (4.8 km) south of Redcar. It is near the mouth of the River Tees. Instead of a village, Kirkleatham could be classified as a collection of buildings that formed the Turner Estate, named for the Turner family who lived at Kirkleatham from 1661. Kirkleatham has one of the best collections of Georgian-style buildings in England. Kirkleatham is the birthplace of Sir William Turner who was Lord Mayor of London in 1669. He gave most of his fortune to found the Sir William Turner’s Hospital in June 1676. In present day, it is an independent almshouse. Turner bequeathed a substantial amount of money to his great nephew, Cholmley Turner, a member of parliament for Yorkshire, 1727–1741, to establish a Free School, built in 1709, that now serves as the local museum. His estate established for the care of 40 people: ten old men, ten old women, ten boys, and ten girls. The office of governor or governess falls upon the owner of the estate. Management of the estate was the responsibility of a chaplain, a master, and a mistress. Cholmley Turner added other Grade I listed buildings, the most notable being the Turner Mausoleum, in memory of his son, and adjoining the Church of St Cuthbert. It is a Grade I listed building on Kirkleatham Lane. The mausoleum was built in 1739–40 by James Gibbs, and restored with added internal cladding in 1839. Entered from the church, it is of Baroque style and of an octagonal plan with south and south-west sides that adjoin the church. It is a single storey with a basement burial chamber. The exterior is heavily rusticated, with an unusually large area vermiculated. It contains the inscription, "This mausoleum was erected 1740 to the memory of Marwood William Turner Esquire the best of sons." Cholmley Turner also retained the architect James Gibbs for building of the chapel at the almshouses. Cholmley Turner’s nephew Sir Charles Turner, 1st Baronet, of Kirkleatham, MP for York from 1768 to 1783, continued building upon the estate. His achievement included remodelling Kirkleatham Hall, as well as providing for the further development of the hospital, school, and a library. He also built the adjoining village of Yearby. In 1894 Kirkleatham became an urban district, but was annexed by Redcar in 1899, after just five years as an independent authority. In 1918, Kirkleatham was the location of a mooring-out station (a secondary base) for airships protecting the east coast based out of RNAS Howden. The site was only used during the latter half of 1918 and was closed permanently after the Armistice. The Free School, built by Cholmley Turner, is now known as Kirkleatham Old Hall and is a Grade II* listed building. Kirkleatham Old Hall Museum functions as the local history museum for Redcar and Cleveland. Opened in 1981, it became the Museum Service's headquarters. Five years later, a new building was opened, providing exhibition space and offices. The finds from the Street House Anglo-Saxon cemetery – the only known Anglo-Saxon royal burial site in north-east England – are displayed in an exhibition at the museum. The artefacts were discovered in nearby Loftus during excavations which took place between 2005 and 2007. Finds include pieces associated with a rare bed burial in which a decorated female body is laid out on a decorated wooden bed, accompanied by fine gold jewellery. The finds include a gold pendant, which would have belonged to a princess. as well as glass beads, pottery, iron knives, belt buckles and other objects. The Kirkleatham Owl and Endangered Species Centre opened to the public in 1990 and is located on the grounds of Kirkleatham Old Hall. The centre is home to one of Britain's largest collections of owls, and is also home to hawks and vultures, a caracara; a talking raven, and a kookaburra. The Sir James Knott Lifeboat Museum is also located on the grounds of Kirkleatham Old Hall. Statues of an elderly man and woman at Sir William Turner's Almhouses, Kirkleatham. The almshouses have been open continuously since 1676. The skull and crossbones gatepost is from the nearby Church of St. Cuthbert with the Mausoleum. ^ "Redcar and Cleveland ward population 2011". Neighbourhood Statistics. Office for National Statistics. Retrieved 23 July 2015. ^ a b c d "Kirkleatham". ihbc.org.uk. Retrieved 15 August 2010. ^ a b Baines, Edward (1823). History, directory & gazetteer, of the county of York: with select lists of the merchants & traders of London, and the principal commercial and manufacturing towns of England; and a variety of other commercial information: also a copious list of the seats of the nobility and gentry of Yorkshire. 2 (Digitized 31 July 2007 ed.). E. Baines. p. 469. ^ "Asset-stripping". Apollo Magazine. 9 August 2007. Archived from the original on 21 July 2010. Retrieved 17 August 2010. ^ Philo, Phil. Kirkleatham: A History of the Village Estate and Old Hall Museum. Langbaurgh on Tees Museum Service. ^ "Turner Mausoleum Adjoining Church of St Cuthbert, Redcar". britishlistedbuildings.co.uk. Retrieved 15 August 2010. ^ "Kirkleatham Civil Parish". A Vision of Britain Through Time. University of Portsmouth. Retrieved 12 December 2017. ^ "Kirkleatham Urban District". A Vision of Britain Through Time. University of Portsmouth. Retrieved 12 December 2017. ^ Philpott, Ian M. (2005). The Royal Air Force : an encyclopedia of the inter-war years. Barnsley: Pen & Sword Aviation. p. 245. ISBN 1-84415-154-9. ^ a b "Kirkleatham Owl and Endangered Species Centre". kirkleathamowlcentre.org.uk. Retrieved 15 August 2010. ^ "Kirkleatham Museums". Redcar & Cleveland Borough Council. Retrieved 3 August 2015. ^ "'Dramatic' ancient cemetery found". BBC News. 20 November 2007. ^ This is Redcar and Cleveland, Issue 10, July 2011 – pages 18, 19. ^ Kirkleatham Anglo Saxon Princess Treasure. 9 May 2011 – via YouTube. ^ "this is Redcar & Cleveland News". ^ Royal Anglo Saxon finds. 13 January 2011 – via YouTube. ^ "The Sir James Knott Lifeboat Museum". Redcar & Cleveland Borough Council. Retrieved 3 August 2015.